Pastor Preus instructs in the Christian faith according to your schedule. Rather than having a class at a particular time periodically throughout the year, he works around your busy life to make sure you are able to attend at your convenience. 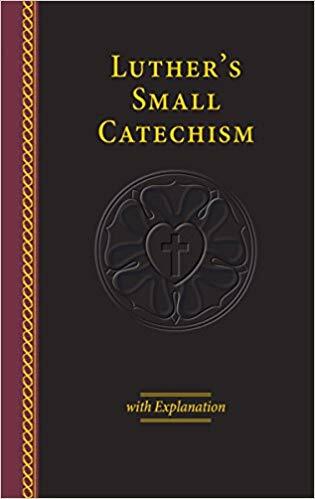 Luther's Small Catechism is the handbook of the Lutheran Church. It simply and concisely takes us through the six main parts of the Christian religion: 1) The Ten Commandments, 2) The Apostles' Creed, 3) The Lord's Prayer, 4) Holy Baptism, 5) Confession & the Office of the Keys, and 6) The Lord's Supper. You will also learn daily prayers, our duties as Christians in our everyday lives, and why we worship the way we do as Lutherans. Check out our "What we believe" page under the "About Us" tab above for more information on our teaching, as well as our "What About?" tab, which gives more pertinent information. Trinity will provide you with Luther's Small Catechism, an instruction book, and a hymnal. If you do not have a Bible, we will also provide you with this. So, in short, bring yourself. We'll provide everything you need. Call the church office (472-5571) or email Pastor Preus to schedule your first meeting.